The Keith-Albee was designed by Scottish-born Thomas Lamb, one of the foremost American theater and cinema architects in the late 19th and early 20th Centuries. Lamb designed approximately 153 theaters around the world. Unfortunately, only forty-three of these grand theaters are still open, and seventy-one have been demolished. Keith and Albee oversaw the construction of two other Lamb-designed theaters at the same time as Huntington's Keith-Albee. These two sister theaters illustrate the possible fates of our theater. The Stanley Theater in Utica, New York has been completely renovated and sees a wide variety of performers – from Broadway to Blue’s Clues – pass through its spotlight. Keith’s Theater in Flushing, New York sits barren and gutted, awaiting demolition for more than twenty years. The Keith-Albee Theatre, which cost $2 million to construct in 1928, was dubbed a “temple of amusement” by Huntington’s Herald-Dispatch newspaper. The paper also made claim that “the premiere evening performance [would] be a truly gala event in the theatrical annals of Huntington.” The opening day performance on May 8, 1928 featured performer Rae Samuels, nicknamed the “Blue Streak of Vaudeville” for her versatile acting ability. At the time it was built the Keith-Albee Theatre was the second biggest theater in the United States, after the Roxy Theater in New York City. Seating approximately 3,000 patrons, it exemplified the opulence and grandeur of the 1920’s with a Mexican Baroque design style. Intricate woodworking, chandeliers, and balconies create an atmosphere of sophistication, along with cosmetic rooms, smoking rooms, and fireplaces for men and women in the restrooms adjoining the main lobby. 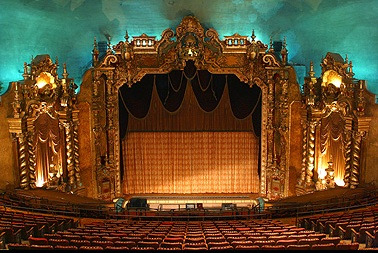 The Keith-Albee Theatre was equipped with a Wurlitzer organ to accompany live performances and motion pictures. The organ was capable of creating almost any sound effect needed for silent films shown in the theater. This original organ was removed and sold in the 1950’s after live music had lost some of its appeal. However, as a result of significant effort by Huntington native Robert Edmunds and his Huntington Theatre Organ Project, Inc., a 1927 Wurlitzer organ was purchased and reinstalled in the Keith-Albee. The Keith-Albee survived a natural disaster when downtown Huntington and the surrounding areas were inundated by the Ohio River in the infamous 1937 flood. A sandbag barricade proved fruitless and seats other first floor artifacts were moved to the balcony. The theater was forced to close from January 23 until February 6 as Fourth Avenue was transformed into a Venetian waterway. The Marshall Artists Series, formed in 1936 for Marshall University, moved to the Keith-Albee in 1939. The Artists Series continues to bring a wide variety of entertainment to Huntington at the Keith-Albee – everything and more from film festivals, Broadway shows, orchestras, and comedians. When Vaudeville faded and talking pictures became the norm, the Keith-Albee installed its first sound system, and also a concession stand to match growing trends. In the 1960’s and 70’s, the Keith-Albee and the Hyman family began to feel the impact of the growing television and motion picture industry. Faced with significant competition from surround sound multi-plexes springing up all over the country, the Hyman’s opted to convert the main auditorium into a three screen movie theater. Two smaller theaters were constructed in the east and west sections of the main auditorium. A fourth theater, and also the smallest, was later added in a retail space facing Fourth Avenue. In celebration of its 50th anniversary, the Keith-Albee featured a recreation of a vaudeville show starring famed singer Rudy Vallee. In 1988 the theater hosted a pre-screening benefit of the blockbuster movie Rainman. Huntington native Joseph Sullivan served as inspiration for the movie, and proceeds from the screening benefited the Huntington Autism Services Center. Actor Dustin Hoffman, as well as director Barry Levinson and producer Mark Johnson, traveled to Huntington and attended the benefit. Hoffman won the Academy Award for Best Actor in a Leading Role for his portrayal of an autistic savant in Rainman. Levinson and Johnson also won Academy Awards for Best Director and Best Picture, respectively. 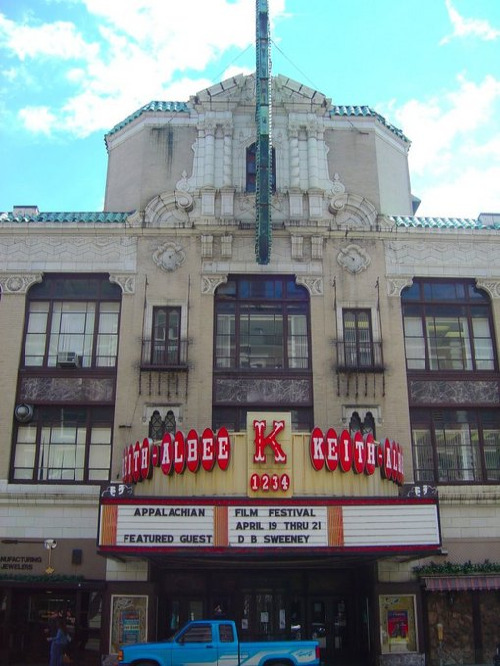 In January of 2006 the Keith-Albee Theatre closed as a functioning movie theater as a result of rising production costs and competition from a new local multiplex. After almost eighty years of owning and operating the theater, the Hyman family gifted their vaudeville treasure over to the Marshall University Foundation, Inc. The MU Foundation has gifted the Keith-Albee Theatre to our newly formed nonprofit organization, the Keith-Albee Performing Arts Center, so that it can be managed and maintained independently. Be an active participant in the economic development of the region because the arts are a key component to prosperity and vitality.